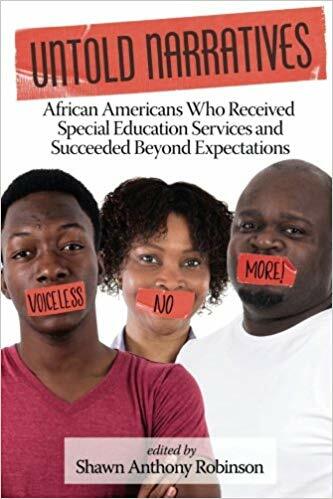 Abstract: This edited book reflects a much needed area of scholarship as the voices of African American (AA) or Black students defined by various labels such as learning disability, blindness/visual impairment, cognitive development, speech or language impairment, and hearing impairment are rare within the scholarly literature. Students tagged with those identifiers within the Pk-20 academic system have not only been ignored, and discounted, but have also had their learning framed from a deficit perspective rather than a strength-based perspective. Moreover, it was uncommon to hear first person narratives about how AA students have understood their positions within the general education and special education systems. Therefore, with a pervasive lack of knowledge when it comes to understanding the experiences of AA with disabilities, this book describes personal experiences, and challenges the idea that AA students with disabilities are substandard. While this book will emphasize successful narratives, it will also provide counter-narratives to demystify the myth that those with disabilities cannot succeed or obtain terminal degrees. Overall, this edited book is a much needed contribution to the scholarly literature and may help teachers across a wide array of academic disciplines in meeting the academic and social needs of AA students with disabilities.